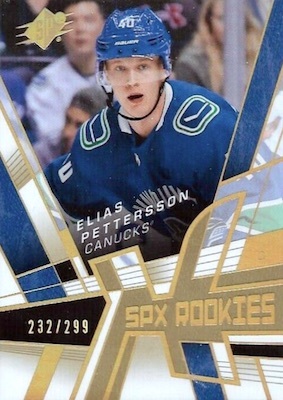 2018-19 SPx Hockey again goes with a less-is-more approach to NHL cards. The seasoned Upper Deck brand provides four cards per Hobby box, with at least one autograph and one relic card expected to be among the haul. Mirroring the 2017-18 version, SPx is also the place to find 2018-19 UD Black Hockey cards. 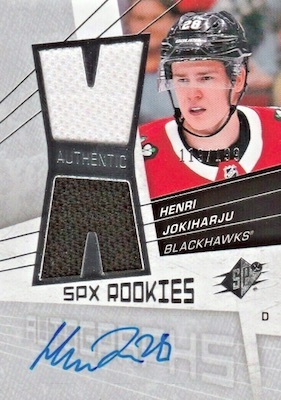 The 2018-19 SPx Hockey base set is part of the technology (i.e. Tech) lineup that averages at least one per box. This includes Base Stars (#/299) and Base Legends (#/299). These cards each have numbered Gold Spectrum parallels. Another choice is found in the Shadow Box Rookies (#/298) subset, which features Light F/X technology paired with a dark finish. There is also the main Rookies insert (#/349). 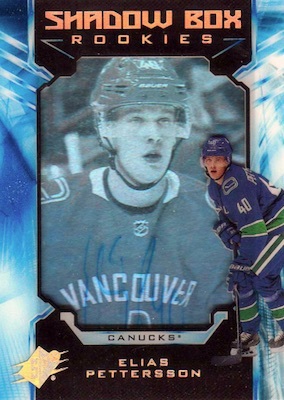 But that's not all as further expansion of the base set takes place in the 2018-19 SPx Hockey checklist. Tiered base editions include Stars Autograph (#/149, #/49 or #/15), Legends Autograph (#/15), and Rookies Autograph (#/249 or #/149). The Shadow Box Rookies Autograph cards also come in Tier 1 (#/198) or Tier 2 (#/98) groups, as do the Gold Spectrum parallels (#/18 or #/8). Bringing relics into the equation are the Stars Gold Premium Material Autograph (#/49, #/25 or #/10), Legends Gold Premium Material Autograph (#/10), and Rookies Gold Premium Material Autograph (#/49 or #/25) cards. Each set adds a one-of-one Black parallel, as well. Additional signed cards come in Lasting Marks (#/25) and Super Scripts (1:16). The Impressions Autos line utilizes tiered rarity, with print runs of 249, 125 or just 25 copies. Various memorabilia cards also enter the mix for the 2018-19 SPx Hockey base set. Options consist of base Stars Material (1:20), Legends Material (1:24), and Rookies Material (1:12) relics. Themed insert lines include the all-new SPxcitement Swatches (1:30) set with jumbo relics. 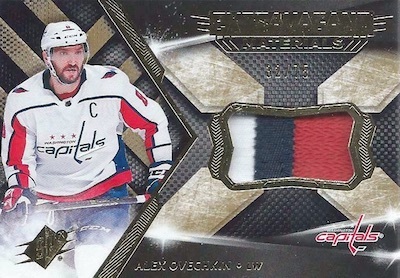 For even more memorabilia, check out Double XL Duos Materials (#/199 or #/99), Extravagant Materials (1:20), and Radiant Materials (1:60). Bringing down the print runs, every relic set offers Premium parallels with limited numbering. 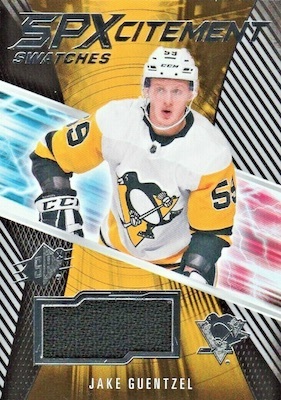 Another Upper Deck NHL brand without a set to call home, 2018-19 UD Black Hockey resides in 2018-19 SPx Hockey. Standouts include the UD Black Lustrous Rookies cards (#/299) that come as Jersey (1:16) parallels, along with on-card Autograph (1:16) and Autograph Patch (#/65 or #/35) versions. 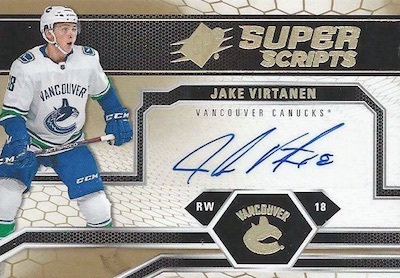 The tough Obsidian Scripts (1:200), Obsidian Material Scripts, Obsidian Scripts Rookies (1:400), and Obsidian Material Scripts Rookies (#/49) sets also boast on-card autographs, plus low-numbered Purple and Gold Spectrum parallels. The jersey-filled UD Black Star Trademarks (#/199) and UD Black Rookie Trademarks (#/299) cards also offer numbered Auto Patch parallels. 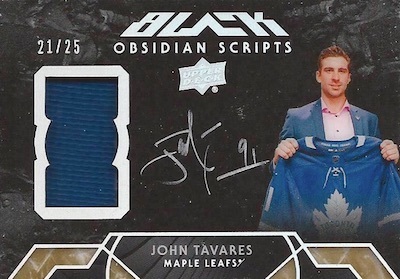 A final UD Black debut in 2018-19 SPx Hockey, UD Black Marks of Obsidian (#/25) showcases gold paint pen autographs from various NHL stars. ETHAN BEAR (RC) 2018-19 BLACK (SPx) LUSTROUS ROOKIE AUTO - EDMONTON OILERS! 24 Silver and 24 Gold parallels. 14 Gold and 17 Black parallels. Overall odds: Stars - 1:20; Legends 1:240. Specific group odds noted below. PARALLEL CARDS: Premium (Stars #/10, Legends #/5). 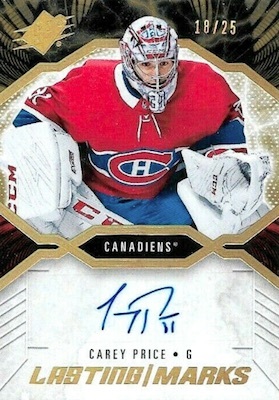 Shop 2018-19 UD SPx Hockey autographs on eBay. Let us know if you spot any others. PARALLEL CARDS: Gold Patch #/25. 23 Gold and 24 Black parallels. Overall odds: Stars - 1:16. Specific group odds noted below. Unannounced. Let us know if you see others. Full guide and gallery. Overall odds - 1:20. Specific group odds noted below. 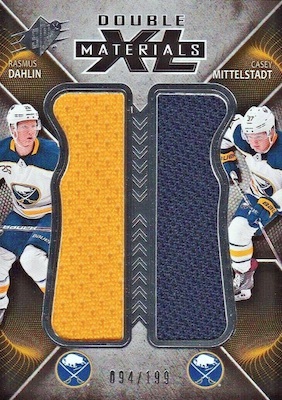 PARALLEL CARDS: Premium #/25 (Dahlin #/10*). Overall odds - 1:30. Specific group odds noted below. 35 cards. Serial numbered #/299. Overall odds - 1:16. Specific group odds noted below. PARALLEL CARDS: Purple Patch #/35 (Dahlin #/15*). Overall odds - 1:200. Specific group odds noted below. PARALLEL CARDS: Purple #/35, Gold #/5*. PARALLEL CARDS: Purple #/35, Gold #/10. PARALLEL CARDS: Purple #/25 or #/15, Gold Tag 1/1. PARALLEL CARDS: Purple Patch #/25, Gold Tag #/3. Overall odds - 1:60. Specific group odds noted below. PARALLEL CARDS: Premium #/35 or less. 18 cards. Serial numbered #/299. View the 2018-19 SPx Hockey checklist Excel spreadsheet. It’s not Upper Deck’s products that are necessarily bad, but it is their pricing for those products. With exclusive licensing, there is no competition to keep prices reasonable. SPx should be a $50/box product. I mean, it’s a four card box with only one autograph guaranteed! I’m with chip, $25 a card? Then they better be 4 autographs. No thank you. 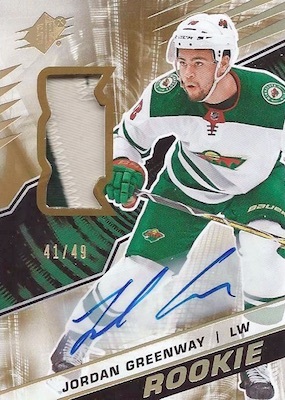 I’ll give it a 2.5 because of price and because our only veteran Auto the Wild (I mean Bruins) is Charlie Coyle…. really? It’not that the product is bad. It’s just the fact that Upper deck is boosting the price knowing very well that, now, group breaks are the (inexpensive ?) way to go. This is bad for the collector who would like to buy a box, it’s too expansive and, also for the local hobby shop that is unable to sell the boxes individually. How could a kid, the future of the hobby, afford to buy cards anymore? Sad, sad sad! Just heads up Trey, the 30th diamond relic is a single diamond of P.K. Subban. Box full time of lame jersey cards of lame players nobody has heard of. This product is not for your average collector. It is a HIGH RISK and HIGH REWARD series of trading cards. I opened quite a bit of this product (over a case), and got some great hits…but having said that, the return on your dollar on SPx is never very flattering! I like the Black Lustrous insert cards and on card autos, but the Shadow Box cards are not impressive at all. The signatures can barely be seen and a lot of them are cut off by the shadow box frame. This is poor quality control if any control at all. Again, more sticker autos….??? The spx brand used to be nice, I dont like where it is headed as of the last couple of years. Upper Deck, please keep it simple! Probably the worst product put out by UD each year is SPx. The 16/17 version had a far greater rookie crop, and a greater variety of hits, and they follow that up by successfully making the subsequent releases hot garbage. The ‘Big’ hits are few and far between, while the majority of the 4 pack boxes offer the value that should be in one. Terrible for the price point. 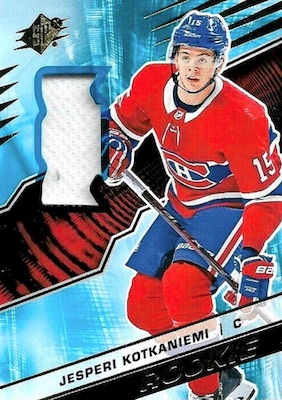 I am paying $30 a pack for a base rookie who may never see the NHL … Unsigned? If you are going to raise prices through the roof, please cut out the mediocre players, only stars. I bought a box recently for $120 … I bought all four packs as singles … the box was really $105 … and got the equivalent of $3 back. Sooner or later, people are going to stop coming back. UD turns a deaf ear. Once they have your cash, they do not care about the consumer. 3 Just pulled a Chelios Honey Nut auto and it is numbered to 35. They can not even get the checklist right. Do you mean the UD Black Obsidian Scripts Autograph card? The base version is not numbered but the Purple parallel is numbered to 35. 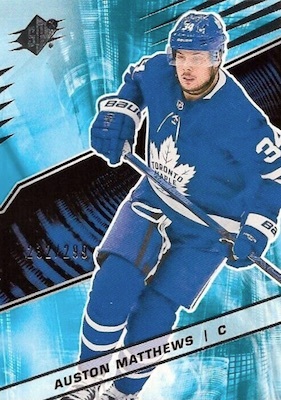 2016 17 UPPER DECK SPX HOCKEY HOBBY BOX - MATTHEWS RC!